Beirut (Arabic: بيروت, Bayrūt, Greek: Βηρυττός Viryttós, French: Beyrouth, Syriac: ܒܝܪܘܬ) is the capital and largest city of Lebanon. The first mention of the city is found in the ancient Egyptian Tell el Amarna letters, dating to the fifteenth century B.C.E., and the city has been continuously inhabited over the centuries since. Excavations in the downtown area have unearthed layers of Phoenician, Hellenistic, Roman, Arab, and Ottoman remains. Prior to 1975, the country was considered the banking capital of the Arab world and was widely known as the "Switzerland of the Middle East" due to numerous financial institutions based in Beirut. The city attracted large numbers of tourists, to the extent that it was referred to as the "Paris of the Middle East." During the Lebanese Civil War of 1975-1990 the city was divided between the largely Muslim west section and the Christian east. As a result of the civil war, the central area of the city, previously the focus of much of the commercial and cultural activity, became a desolate "no man's land." After the long and destructive war, Beirut rebuilt itself, and the redesigned city center, marina, pubs, and nightlife districts have made it once again a popular tourist destination. Beirut holds Lebanon's seat of government and plays a central role in the Lebanese economy. It is renowned for its theaters and cultural centers. Beirut has kept pace to return to its former glory and it remains an important city in the Middle East, especially in terms of its tolerance and practice of freedom of the press. 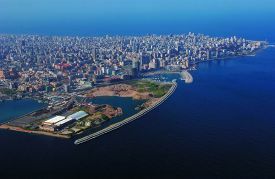 Located on a peninsula that extends west at the midpoint of Lebanon's coastline with the Mediterranean Sea, Beirut serves as the country's main seaport and forms the Beirut District. Flanked by the Lebanon mountains, the city has taken on a triangular shape, largely influenced by its situation between and atop two hills: Al-Ashrafieh and Al-Musaytibah. 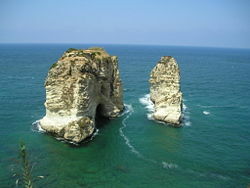 Beirut's coast consists of rocky beaches, sandy shores, and cliffs. The Beirut Governorate area covers 6.9 square miles (18 square kilometers), and the city's metropolitan area covers 26 square miles (67 square kilometers). Beirut has a Mediterranean climate characterized by a hot and humid summer, pleasant autumn and spring, and a cool, rainy winter. August is the hottest month with an average high temperature of 85°F (29°C). January and February are the coldest months with an average low temperature of 50°F (10°C). During the afternoon and evening the prevailing wind direction is onshore, from the west, while at night the wind direction reverses to offshore, from the land. Winter is the rainy season, with most precipitation falling after December. The average annual rainfall is 34.1 inches (860 mm), falling in heavy cloudbursts in winter. Air pollution from car exhausts and private electricity generators, inadequate waste disposal, deforestation, and excessive removal of beach sand are among environmental problems facing Beirut. 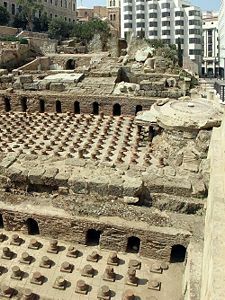 Roman baths in downtown Beirut. 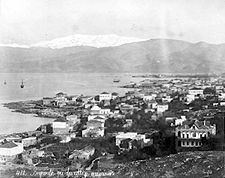 Nineteenth century view of Beirut with snow-capped Mount Sannine in the background. Nineteenth century view of Beirut's Grand Serail. 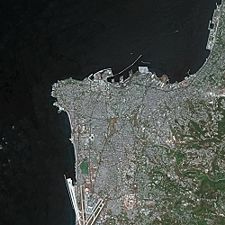 Beirut seen from SPOT satellite. Originally named Bêrūt, The Wells, which refers to the underground water supply there, by the Phoenicians, Beirut's history goes back more than 5,000 years. Excavations in the downtown area have unearthed layers of Phoenician, Hellenistic, Roman, Arab, and Ottoman remains. The first historical reference to Beirut dates from the fourteenth century B.C.E., when it was mentioned in the cuneiform tablets of the "Amarna letters," when Ammunira of Biruta (Beirut) sent three letters to the pharaoh of Egypt. Biruta is also referenced in the letters from Rib-Hadda of Byblos. The most ancient settlement was on an island in the river that progressively silted up. The city was known in antiquity as "Berytus." In 140 B.C.E., Diodotus Tryphon seized and destroyed the city in his contest with Antiochus VII Sidetes for the throne of the Seleucid monarchy. Beirut was soon rebuilt on a more regular Hellenistic plan, renamed Laodicea in Phoenicia or Laodicea in Canaan, in honor of a Seleucid Laodice. Mid-first century coins of Berytus bear the head of Tyche, goddess of fortune. On the reverse, the city's symbol appears: a dolphin entwining an anchor. Beirut was conquered by Agrippa in 64 B.C.E. and the city was renamed in honor of the emperor's daughter, Julia; its full name became "Colonia Julia Augusta Felix Berytus." The veterans of two Roman legions were established in the city: The fifth Macedonian and the third Gallic. The city quickly became Romanized; large public buildings and monuments were erected and Berytus enjoyed full status as a part of the empire. Under the Romans, it was enriched by the dynasty of Herod the Great (73 B.C.E.-4 B.C.E. ), and was made a colonia, "Colonia Iulia Augusta Felix Berytus," in 14 B.C.E. Beirut's School of Law was widely known at the time. Two of Rome's most famous jurists, Papinian and Ulpian, both natives of Phoenicia, taught at the law school under the Severan emperors. When Justinian (483-565) assembled his Pandects in the sixth century, a large part of the corpus of laws were derived from these two jurists, and Justinian recognized the school as one of the three official law schools of the empire (533). Within a few years, as the result of a triple catastrophe of earthquake, tidal wave and fire (551), the students were transferred to Sidon. About 30,000 were killed in Berytus alone and, along the Phoenician coast total casualties were close to 250,000. Beirut passed to the Arabs in 635. As a trading center of the eastern Mediterranean, Beirut was overshadowed by Akka during the Middle Ages. From 1110 to 1291, it was in the hands of the Crusaders. No matter who was its nominal overlord, whether Turk or Mamluk, Beirut was ruled locally by Druze emirs. One of these, Fakr ed-Din Maan II (1572-1635), fortified it early in the seventeenth century. The Ottomans retook it in 1763 and thenceforth, with the help of Damascus, Beirut successfully broke Akka's monopoly on Syrian maritime trade and for a few years supplanted it as the main trading center in the region. During the succeeding epoch of rebellion against Ottoman hegemony at Akka under Jezzar (1720-1804) and Abdullah pashas, Beirut declined to a small town (population about 10,000), and was fought over among the Druze, the Turks, and the pashas. After Ibrahim Pasha (1789–1848) captured Akka in 1832, Beirut began its early modern revival. In 1888, Beirut was made capital of a vilayet in Syria, including the sanjaks Latakia, Tripoli, Beirut, Akka and Bekaa. Beirut became a cosmopolitan city and had close links with Europe and the United States. Beirut became a center of missionary activity, which was generally unsuccessful in conversions (a massacre of Christians in 1860 was the occasion for further European interventions), but did build an impressive education system. This included the Syrian Protestant College, which was established by American missionaries and eventually became the American University of Beirut. Beirut became the center of Arab intellectual activity in the nineteenth century. Provided with water from a British company and gas from a French one, the city thrived on exporting silk grown on nearby Mount Lebanon. After French engineers established a modern harbor in 1894, and a rail link across Lebanon to Damascus, and then to Aleppo in 1907, much of the trade was carried by French ships to Marseille, and soon French influence in the area exceeded that of any other European power. In 1911, the population mix was reported as Muslims, 36,000; Christians, 77,000; Jews, 2500; Druze, 400; foreigners, 4100. After the collapse of the Ottoman Empire following World War I (1914-1918), Beirut, along with all of Lebanon was placed under the French Mandate. Lebanon achieved independence in 1943, and Beirut became its capital city and remained the intellectual capital of the Arab world, and a major commercial and tourist center, until 1975, when a brutal civil war broke out in the country. In response to an attack on an El Al jet in Athens on the night of December 28, 1968, Israeli commandos mounted a surprise attack on the airport and destroyed 13 civilian aircraft belonging to the Lebanese carrier, Middle East Airlines. During most of the war, the city was divided between the largely Muslim west section and the Christian east. The central area of the city, previously the focus of much of the commercial and cultural activity, became a "no man's land." Many of the city's inhabitants fled to other countries. In 1983, French and U.S. barracks were bombed, killing 58 French and 241 American servicemen. Since the end of the war in 1990, the people of Lebanon have been rebuilding Beirut, and by the beginning of the 2006 Israel-Lebanon conflict the city had somewhat regained its status as a tourist, cultural, and intellectual center in the Middle East, as well as a center for commerce, fashion, and media. However, many would say the city has lost its premier status, due to competition from places such as Dubai and Cyprus in the fields of tourism, business, fashion, commerce, and banking. Reconstruction of downtown Beirut has been largely driven by Solidere, a development company established in 1994 by Rafik Hariri. The 2005 assassination of former Lebanese Prime Minister Rafik Hariri near the Saint George Bay in Beirut shook the entire country. Approximately one million people gathered for an opposition rally in Beirut a month following his death. The "Cedar Revolution" was the largest rally in Lebanon's history. The last Syrian troops withdrew from Beirut on April 26, 2005. Since the modern city overlies the ancient one, little archaeology had been done until after the end of the civil war in 1991. 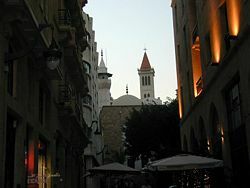 A dig in 1994 established that one of Beirut's modern streets, Souk Tawile, follows the lines of an ancient Hellenistic/Roman street. The Lebanese Republic has a parliamentary democracy in which the highest offices are proportionately reserved for representatives from various religious communities to minimize sectarian conflict—a framework known as “confessionalism.” The chief of state is the president, who is elected by the National Assembly for a six-year term. The head of government is the prime minister, who, with the deputy prime minister, is appointed by the president in consultation with the 128-seat National Assembly. The Beirut is one of six mohafazah (state governorates; mohafazat, singular), with the others being Beqaa, North Lebanon, South Lebanon, Mount Lebanon, and Nabatiye. Beirut is divided into 12 neighborhoods. These are: Ashrafieh, Beshoura, Dar el Mreyseh, Marfa’, Mazra’a, Mdawar, Mina El Hosson, Msaytbeh, Ras Beirut, Rmeil, Saifi, and Zkak El Blat. Four of the 12 official Palestinian refugee camps in Lebanon are located in Beirut. These are: Burj el-Barajneh, Dbayeh, Mar Elias, and Shatila. Of the 15 unregistered or unofficial refugee camps, Sabra, which lies adjacent to Shatila, is located in Beirut. The city is home to numerous international organizations. The United Nations Economic and Social Commission for Western Asia (ESCWA) is headquartered in Downtown Beirut, while the International Labour Organization (ILO) and UNESCO (United Nations Educational, Scientific and Cultural Organization) both have regional offices in Beirut covering the Arab world. The Arab Air Carriers Organization (AACO) is also headquartered in Beirut. Beirut was the economic, social, intellectual, and cultural hub of the Arab Middle East from 1952 until 1975. The city was banking center for Arab wealth, and the port was a leading entrepôt for the region. Beirut had a busy tourist industry, and numerous uncensored newspapers kept the Arab world informed. But the 1975-1990 civil war seriously damaged Lebanon's economic infrastructure, cut national output by half, and all but ended Lebanon's position. In the years since, Lebanon has rebuilt much of its war-torn physical and financial infrastructure by borrowing heavily—mostly from domestic banks. The Israeli-Hizballah conflict in July-August 2006 caused an estimated $3.6 billion in infrastructure damage, and prompted international donors to pledge nearly $1 billion in recovery and reconstruction assistance. Lebanon has a competitive and free market regime and a strong laissez-faire commercial tradition. Private property is common and encouraged, while the government owns most public services. Land laws resemble those in France and the United States. The Lebanese economy is service-oriented; main growth sectors include banking and tourism. Beirut is the main center for newspaper and book publishing industries, and for satellite television stations, such as LBC, Future TV, New TV, and others. Dubbed “Paris of the East,” there is plenty of sightseeing, shopping, cuisine, and nightlife for tourists. Lebanon's capital city has been described as a vibrant, stylish metropolis, with sleek, modern buildings alongside arabesque Ottoman and French-style buildings. Before the war broke out in Lebanon in 2006, Travel and Leisure Magazine's World Best Awards 2006 ranked Beirut as ninth best city in the world, falling just short of New York City and coming ahead of San Francisco. Per capita GDP was $6681 in 2006, giving Lebanon a rank of 90 on a list of 181 countries. The unemployment rate was 20 percent in 2006. The Beirut Rafic Hariri International Airport, which was opened in 1954, is located 5.6 miles (9 km) from the city center in the southern suburbs. It is the only operational commercial airport in the country, and is the hub for Lebanon's national carrier, Middle East Airlines. 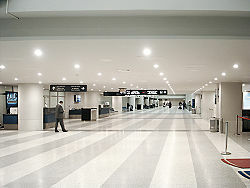 Beirut has a world-class facility which is ranked among the top airports in the Middle East. It is the main port of entry into the country along with the Port of Beirut. Beirut has taxicabs, service taxis, and publicly owned buses, and has bus connections to other cities in Lebanon as well as to cities in Syria. Mosque and Church in downtown Beirut. The museum of the American University of Beirut. There are wide-ranging estimates of Beirut's population, from as low as 938,940 people, to 1,303,129 people, to as high as 2,012,000. The lack of an exact figure is due to the fact that no population census has been taken in Lebanon since 1932. Arabs make up 95 percent of the population, Armenians four percent, others one percent. Arabs reached Lebanon in the seventh century, and their culture was superimposed on an already diverse ethnic population. Many Christian Lebanese do not identify themselves as Arab, but rather as descendants of the ancient Canaanites and prefer to be called Phoenicians. Beirut is one of the most religiously diverse cities of the Middle East, and the city has had a history of political strife due to a roughly even division between Christians and Muslims. The nine major religious sects there are (Sunni Muslim, Shiite Muslim, Druze, Maronite Catholic, Greek Orthodox, Greek Catholic, Armenian Orthodox, Armenian Catholic, and Protestant). Several decades ago, Beirut was home to a Jewish community, in Wadi Abu Jamil neighborhood. Religious authorities handle marriage, divorce, and inheritance. Calls for civil marriage have been rejected, although foreign civil marriages are recognized. 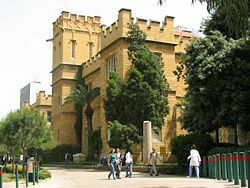 The Lebanese University is the only public tertiary institution in Beirut, which is home to some of the most well-renowned universities in the Middle East, such as the American University of Beirut, Université Saint-Joseph, Haigazian University, and the Lebanese American University. Famous private schools include the International College, the American Community School, the Collège Protestant Français, the Collège Louise Wegman, and the Grand Lycée Franco-Libanais. The higher education system is based on the Baccalauréat libanais, but the Baccalauréat Français is accepted as an equivalent. Before being admitted to any higher education institution, one must achieve his or her Baccalauréat examinations. Atmosphere is what Beirut delivers best. Its mix of peoples, religions, and cultures gives the city a dynamic edge. There are hundreds of art galleries there, and the city is home to more than 5,000 artists working in fine arts, music, design, architecture, theater, film, and photography. Beirut is home to international fashion designers such as Elie Saab, Zuhair Murad, and Georges Chakra, and jeweler Robert Moawad. The Corniche, a long seaside promenade, which is a public gathering space with wonderful views of the coast. Pigeon Rocks, rock formations in a cove in Raouche. The Grand Serail, also known as the Government Palace, which is the headquarters of the Prime Minister of Lebanon. It is situated atop a hill in downtown Beirut a few blocks away from the Lebanese Parliament. An historic building, it is the most important of three Ottoman monuments on the hill—the other two are the Council for Development and Reconstruction and the Hamidiyyeh clock tower. The St. George Greek Orthodox Cathedral, and the St. George Maronite Cathedral. The Roman Baths, and other downtown archaeological sites, which are being restored for public viewing. The National Museum, which is the principal museum of archaeology in Lebanon. About 1,300 artifacts are exhibited, ranging from prehistoric times to the medieval Mamluk period. During the 1975 Lebanese Civil War, the museum stood on the front line that separated the warring factions. The smaller American University of Beirut Archaeology Museum, which is the third oldest museum in the Middle East, it exhibits a wide range of artifacts from Lebanon and neighboring countries. The Sursock Museum, which was built by the Sursock family at the end of the nineteenth century as a private villa, occasionally displays antiquities, but its primary focus is on contemporary Lebanese art. Ashrafieh, where the Sursock Museum is located, is a neighborhood with narrow, winding streets and some beautiful old residences. Hamra, south of the American University, is a good place to soak up the city's daily life. Beirut was once considered the most Westernized city in the Arab Middle East, and its hub of economic, social, intellectual, and cultural life. However, it was ravaged by a 15 year long civil war (1975-1990) from which it has not fully recovered. Prior to the war, foreign banking and business firms favored Beirut as a base for their Middle East operations. It was considered a liberal city in a liberal country, in the midst of nations ruled by authoritarian or militarist regimes. Lebanon's ending to its civil war did not mean an end of strife. Beirut attracted Palestinian resistance organizations in the latter half of the 1960s and became headquarters to the Palestine Liberation Organization (PLO) in 1970. Israeli troops trapped the PLO in the city in 1982, requiring intercession by multinational forces. Still violence continued and Beirut was essentially a warzone, causing many residents and businesses to leave the city. Since 1990, the city has made extensive reconstruction efforts to restore its infrastructure, economic base, and historic landmarks. 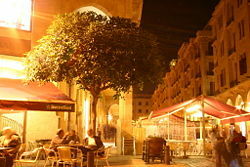 Prior to the war, Beirut was a popular tourist destination and is becoming so again in the early years of the twenty-first century. Headway has been made within the economic sector—Travel and Leisure Magazine's World Best Awards 2006 ranked Beirut as ninth best city in the world, falling just short of New York City and coming ahead of San Francisco. However, this was prior to the 2006 Israel-Lebanon conflict. Recurring instability no doubt hampers the city's efforts at regaining its previous glory. In addition, there is now competition from places such as Dubai and Cyprus in the fields of tourism, business, fashion, commerce, and banking. However, the air of tolerance in Beirut is a strong asset. While censorship of the press is strong in many Middle Eastern countries, it enjoys freedom in Lebanon. Catering to the Arab world at large, Lebanese printing actually expanded during the war years to become one of the country’s major industries. No doubt Beirut will remain an important city within Lebanon, and to the larger world in some respects, however its years of war have taken its toll and it is not likely to return to the position it once held. ↑ United Nations Statistics Division, Population of capital cities and cities of 100,000 and more inhabitants. Retrieved July 29, 2008. ↑ Encyclopedia of the Nations, Lebanon Population. Retrieved July 29, 2008. Encyclopædia Britannica Online. 2008. Beirut. Retrieved July 26, 2008. Hall, Linda Jones. Roman Berytus Beirut in Late Antiquity. London: Routledge, 2004. ISBN 978-0203499078. Jehl, Douglas. Under Beirut's Rubble, Remnants of 5000 Years of Civilization. The New York Times, February 23, 1997.Retrieved July 24, 2008. Khawlie, Mohammed. Milk, honey and muck. New Internationalist. Retrieved July 26, 2008. Lebanese Embassy of the U.S. Profile of Lebanon: History. Retrieved May 31, 2016. McPherson, Larry E. Beirut City Center. Göttingen: Steidl, 2006. ISBN 978-3865212184. Prados, Alfred B. Lebanon Congressional Research Service, Library of Congress. 2006. Retrieved July 29, 2008. Talbert, Richard J. A., and Roger S. Bagnall. Barrington Atlas of the Greek and Roman World. Princeton, NJ: Princeton University Press, 2000. ISBN 978-0691031699. Ṭarābulsī, Fawwāz. A History of Modern Lebanon. London: Pluto, 2007. ISBN 978-0745324388. This page was last modified on 31 May 2016, at 20:58.